A while back we reported rumors that Deathstorm might make his way to DC’s New 52. 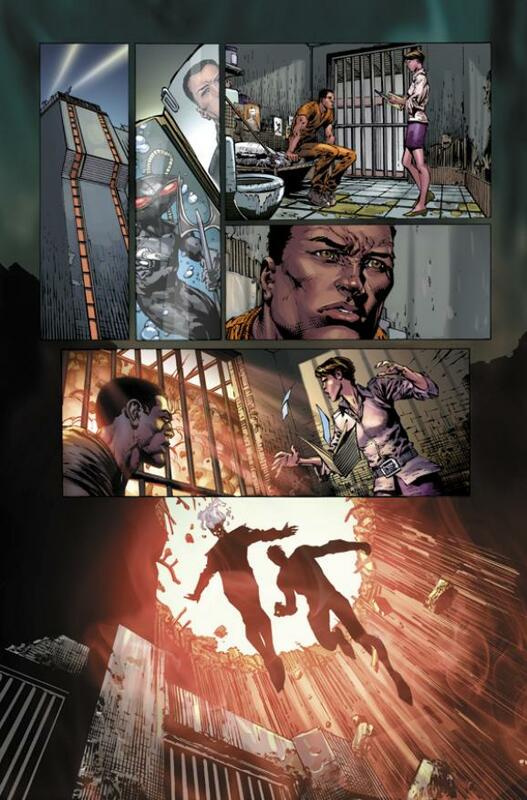 Well, we can now confirm Deathstorm’s return in the upcoming Forever Evil mini-series. Wondering how Deathstorm can appear in the New 52, even though Firestorm didn’t appear in the New 52 version of Blackest Night? Well, share your own speculation in the comments! Also, check out the post from last week and read other Match-heads speculation. Personally, I’m leaning towards the villains in Forever Evil (identified as the Crime Syndicate) as residents of an alternate Earth, and Deathstorm is simply Firestorm’s opposite member. We’ll see soon enough! <rant> Now for a little editorial. I’m just gonna lay my cards on the table here… I didn’t care for Deathstorm in Brightest Day. Visually, he’s cool looking, however, his personality and actions grated on my nerves (specifically his use of language and gory attacks). When writing Brightest Day, Geoff Johns said the following about Deathstorm, “He’s a character that’s really fun to write. We wanted to basically create a 1990s villain who loved being from the 1990s.” If that was Geoff’s plan for the character, I think he accomplished his goal during Blackest Night and Brightest Day as the character was a pastiche of bad ’90s stereotypes. However, that’s exactly what Deathstorm was, a stereotype. He represented the bad feelings people have towards ’90s comics, but the reality is that many ’90s comics and villains were very good. Saying Deathstorm represents ’90s villains is like saying Disco represents the 1970s. There was more to the ’70s than Disco, and there was more to ’90s villains than the stereotypes Deathstorm represented. While I’m a child of ’80s comics, I read and enjoyed many comics in the ’90s. Lots of people take cheap shots at ’90s comics nowadays, and I can’t help but stand up for them. Maybe it’s because I enjoyed so many comics during that decade, or maybe it’s because I’m hard-wired as a geek to stand up for the underdog. Either way, I wish people would start celebrating the better aspects of the ’90s instead of trying to further tear down what was bad. Additionally, Geoff Johns has been known to use characters as a cipher for his commentary. Geoff’s quote above indicates that Deathstorm was his commentary on ’90s villains. Geoff’s said in other places that Superboy-Prime was supposed to represent whiny fanboys. Also, I suspect that Murk (appearing in recent issues of Aquaman) is Geoff’s commentary on ’90s Aquaman. Since Firestorm was barely active in the ’90s, it seems to me that commentary on ’90s villains would be better suited attached to a character that was actually popular during that decade. My thanks to Brandon Leonard and Russ Burlingame for the heads-up on Deathstorm’s return! Support Firestorm (and Deathstorm, I guess)! Fan the flame! Posted in: Comic books, Deathstorm/Black Lantern Firestorm, Geoff Johns, News. Firestorm wasn’t in the new DC52 Brightest Day? This whole reboot thing is getting harder and harder to keep track of. An opposing Firestorm in the CSA has been long overdue. Hopefully opposites of other deserving (if that’s the right word) Leaguers get in too. I’d like to say Red Tornado, but I’m not sure if he’s existed yet (sigh). Okay, Shag, you lost me when you dissed on disco. Disco is just funk that white people can understand (handclaps on the downbeats, etc.). Long live Lipps, Inc., bay-bay! I guess Deathstorm was only a matter of time. He is visually striking but he’s also very one dimensional. I also thinks he stems from the very non-creative idea that every hero should have his opposite, which for me started with Professor Zoom, Reverse Flash. Batman got Catman. Superman got Cyborg Superman. Green Lantern got an entire rainbow. In a way it’s flattering to our favourite hero and so long as it gives Firestorm a little more exposure, I’m okay with it. I probably should have said Supes got Bizarro Superman. Firestorm technically got a Bizarro Firestorm at one time too, didn’t he? Hear hear. The 1990s had much better comics than people realize; the “bad” stuff was often confined to a short span of years in the early part of the decade. Folks seem to forget that stuff like Sandman, Starman, Morrison’s JLA, Waid’s Flash…all 1990s books. (Yes, I know Sandman started in the late ’80s, but you get my drift.) In fact, I’ll come right out and say it: the 1990s are my favorite decade of comics, even though I grew up on the 1980s stuff. Since Shag mentioned how Deathstorm’s use of language grated on him, now that I think about it, I wonder if a certain amount of the visual appearance and language of Fury (Hulk on Fire, that is, not Earth-2’s Steve Trevor and Wonder Woman superdaughter) was supposed to be based on Deathstorm. It’s a new earth 3 Deathstorm.